The Datalogic Gryphon Bluetooth has been discontinued. No direct replacement is available. 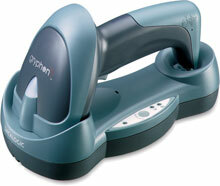 The Datalogic Gryphon Bluetooth is the newest member of the successful Datalogic Gryphon mobile family. They share the same powerful architecture of the other models with a special addition: the latest innovation in the wireless communication, Bluetooth technology. This technology provides the operator with wider mobility and no cable constraint. Bluetooth is a standard defined worldwide, and it allows various devices manufactured by different companies to easily connect and communicate with each other. The optimized optics of the Datalogic Gryphon Bluetooth allow reading of the most popular standard codes with superior depths of field from near contact to over 43 cm (long range version). The "green spot" produced by the Datalogic Gryphon Bluetooth provides "good reading" feedback directly on the code, useful in under-lighted or noisy environments. BT100 Bluetooth scanner kit. Includes, base charging station & manual. Order power supply separately. See accessories. Requires existing Bluetooth capability in host PC. BT200 PDF417 Bluetooth scanner kit. Includes, base charging station, & manual. Order power supply separately. See accessories. Requires existing Bluetooth capability in host PC.